The Reserve Bank of India (RBI) today came out with a credit default swap (CDS) guidelines that would allow corporate entities including insurers, FIIs and mutual funds (MFs) to hedge risk against default in corporate bonds to which they subscribe. The guidelines, which were finalised by the RBI after receiving views from stakeholders, will come into effect from October 24, it said in a notification. 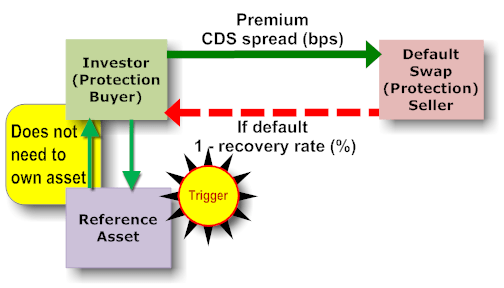 CDS is a risk management product which helps entities guard against possibility of defaults in repayment of corporate bonds. As per guidelines, foreign institutional investors (FIIs), banks, insurers, NBFCs, listed companies, housing finance companies, provident funds and primary dealers can buy credit protection under the scheme. It further said that banks, primary dealers and NBFCs with sound financial and good track record will be allowed to act as market makers or facilitators (for buying and selling of such swaps). The bonds for the purpose of CDS would include unlisted and unrated debt instruments, including those issued by the infrastructure companies engaged in sector like road, port and telecommunication, power among others. CDS would increase investors’ interest in corporate bonds and would be beneficial to the development of the corporate bond market in India. Elaborating on the guidelines, the RBI said that beside banks, the NBFCs and primary dealers with a net owned fund of Rs 500 crore will be permitted to act as market makers. The guidelines further said that entities will only be allowed to buy CDS contracts to hedge credit risk and not for speculation. Earlier in February, the RBI had formed the draft guidelines for allowing corporates to hedge risk against CDS. The central bank had in 2008 planned to introduce the CDS for corporate bonds, but postponed the move in view of the global financial crisis, which was caused by large scale trading in such debt instruments. Nifty and Bank Nifty 90 min charts for 1st Apr 2011 trading Nifty and Bank still in uptrend with supports coming around 5703 and 11527 respectively.